I’ve been living low carb so long and the home is also pretty low carb (haha including my rabbit) that I struggled today with making our guest speaker’s coffee. Coffee with a packet of sugar???? We’ve been running a conference at work this weekend and one of our visiting speakers is a definite sugar-holic. The penny dropped when we asked him if he wanted a snack after a series of talks and he asked for an ice cream. I’ve been watching him down coke and cake with growing distress. So the charts above are real. 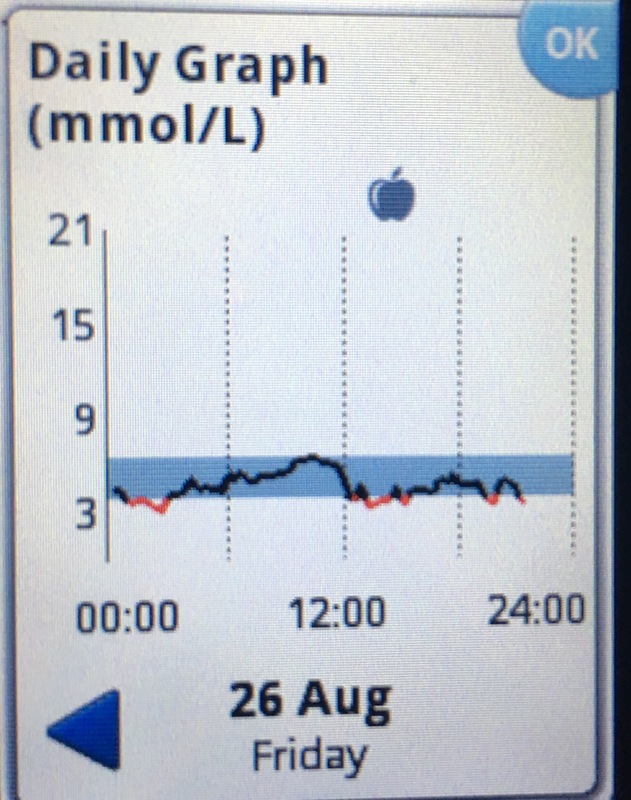 The first day or two using the Freestyle Libre allowed me to see my own graph with carb restricted lifestyle and I think I only went close to 6 mmol/L once, likely due to a combination of dawn phenomenon and a slightly higher protein intake that morning. So back to the sugar thing. After a couple of years navigating this low carb lifestyle I get taken aback when I see someone who is clearly craving sugar. And I do understand it. 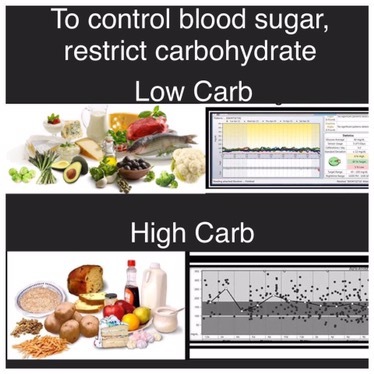 I remember the peaks and troughs of hunger with a regular diet and now with the low carb diet I am actually less hungry and have more consistent energy levels during the day. Hubs does ask me sometimes what my brain runs on and I do point out to him that brains can use ketones as fuel. Do I get cravings? Yes of course, and I do fall off the wagon sometimes, but I’ve been able to get back on and keep a relatively even keel to maintain decent HbA1C levels. Just don’t wave that bag of chips too often at me. So this week’s recipe is a soup – a simple and hearty meal on its own. 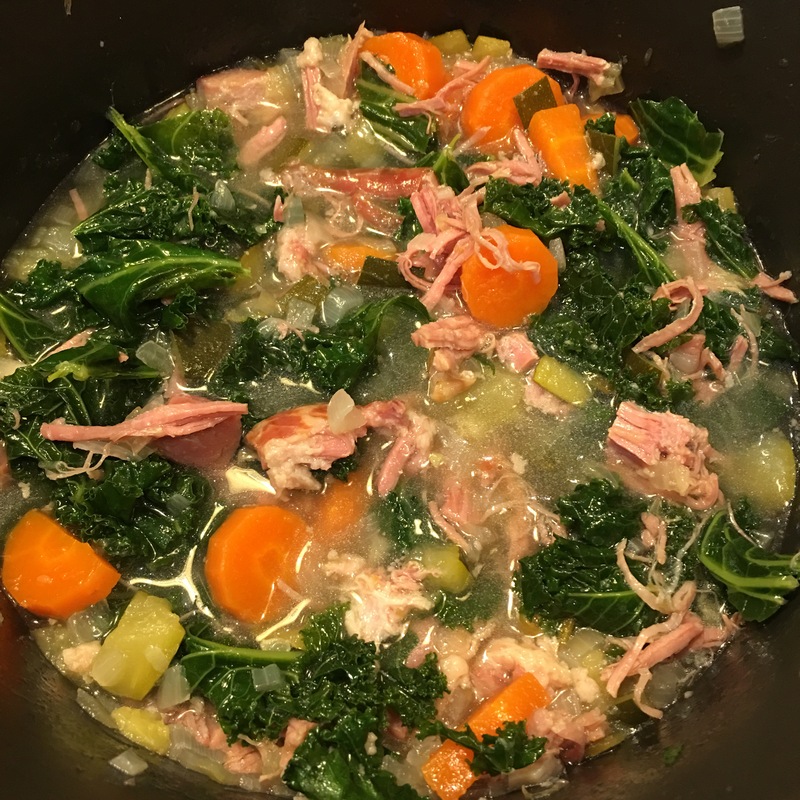 Kale is an awesome vegetable that holds up well in soup even with reheating. Leftovers made up my lunch the next day. The smoked ham gives a hearty smoky robust flavor to the soup. This comforting meal goes beyond just survival to pure pleasure. Put the water, smoked ham, carrots, celery, onion and pepper in a large soup pot and heat over medium heat. Simmer for about 1/2 hour to 40 minutes till the smoked ham has softened. Remove the smoked ham and shred, then return to the pot. Add the kale to the pot and boil for about 5-10 minutes. Taste soup and season appropriately; the smoked ham already will salt the soup.